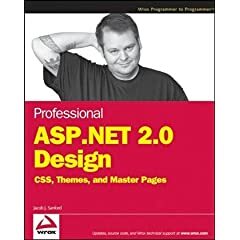 Professional ASP.NET 2.0 Design: CSS, Themes, and Master Pages by Jacob Sanford is a great book for ASP.NET developers looking to expand their knowledge on the ASP.NET 2.0 Web Design front. I've read this book, re-read it, edited it, and would like to give it away – I was the Technical Editor. The books is like new and (did I mention) it's free! Updated! Just Leave a comment with a valid email address! Post a 500 x 200 pixel image of something you're working on in the comments of this post – this image could be code, web design, or anything work related. The winner will be chosen April 1st May 1st, they'll be drawn at random, and will be notified through email. * I've included a sample entry in the comments. If you're looking for a great free photo editing application then try Paint.net. If you're looking to host your image you might want to consider Flickr or Photobucket. The contest has ended, and the winner is….. Andrew Hinde. Nice! Loosely typed / weakly languages are amazing! But… for myself, coming to this conclusion was like an acquired taste. I was suffering from Software Ethnocentrism. Software Ethnocentrism often entails the belief that one’s programming language or development environment is the most important and/or … are superior to those of other software developers. Within this ideology, software developers will judge other groups in relation to their own particular development environment or culture, especially with concern to programming language, methodologies, behaviour, customs, and religion. - the derived definition (above) is based on Wikipedia’s article on Ethnocentrism. Do you too suffer from Software Ethnocentrism? Try staving off this programming language tunnel vision, learn a new type of programming language. It might be a better investment in your time than becoming obsessed over a microcosm (like say unit testing and TDD). Cartoon Notes: I took this cartoon from Steve Yegge’s blog titled Egomania Itself. It represents the irony of static type languages where everything is a named type – presumably the owner of the property is naming all his objects so he can remember what they are, but in loosely type languages, If it walks like a dog and barks like a dog, I would call it a dog. Read more about Dog Typing er… Duck Typing.